I love themes! Call me a Pinterest Parent, but there is nothing more exciting to me than brainstorming and bringing to life an entire themed event – whether it’s a unit study or a holiday party — I’m all over it. 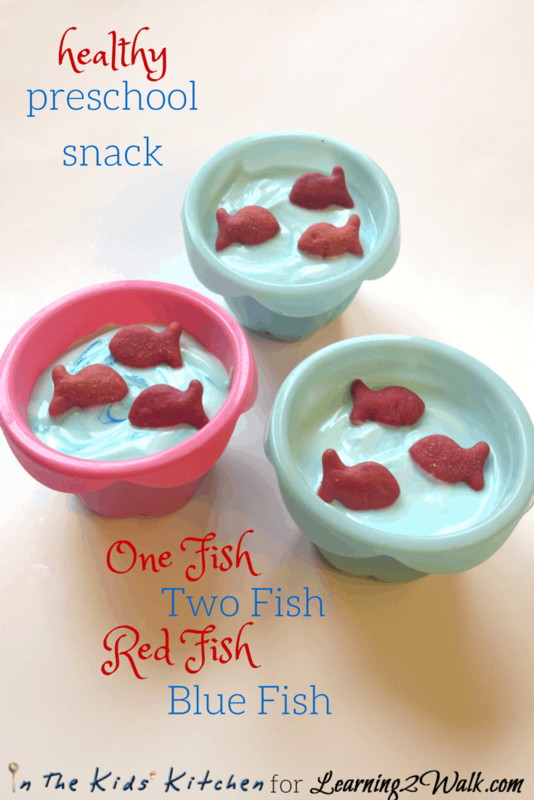 When Alecia told me that she was reading “One Fish Two Fish Red Fish Blue Fish” with her daughter, I KNEW I had to send her a Dr. Seuss snacks for preschool idea! I immediately thought of these naturally-coloured Goldfish that we used during our Secondary Colours Unit almost two years ago, but once I opened it I was a bit disappointed to find no blue fish! While I was trying to brainstorm a new idea, the kids and I started baking cupcakes and those cute Ikea baking cups completely inspired me! I snagged three baking cups from our collection (the kids were not too impressed in the moment) and grabbed the yogurt out of the fridge. I used one drop of natural blue food colouring to transform 3/4 cup of yogurt into “the blue sea” and divided it up amongst the baking cups! 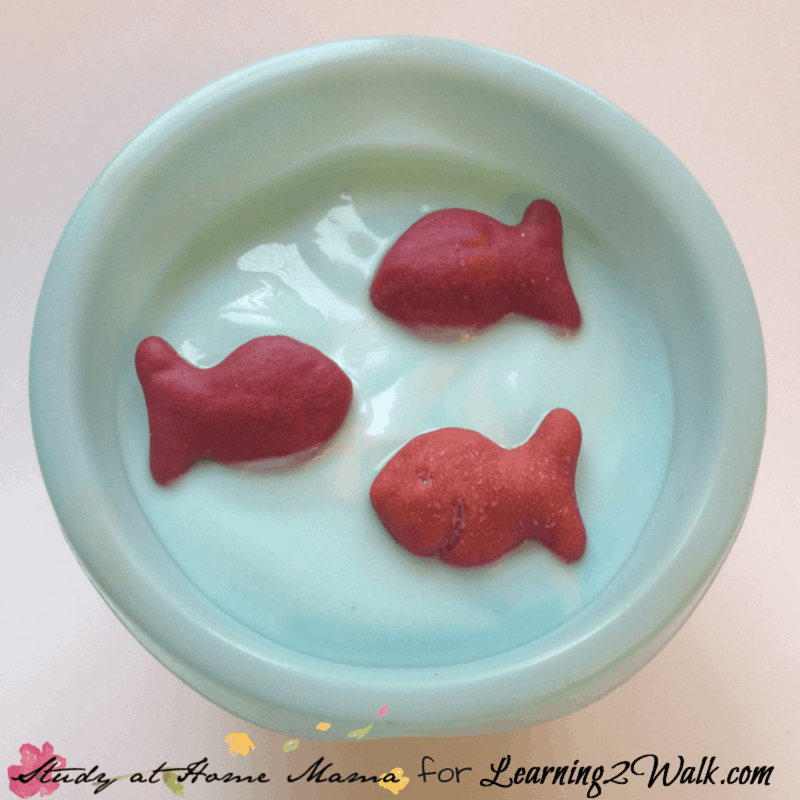 I topped the yogurt off with 3 of the red Goldish (“one fish, two fish”) and this easy kid’s snack was done! I even had enough time left over to make some One Fish Two Fish Red Fish Blue Fish trail mix! The kids thought this healthy preschool snack was hilarious, and even my one who usually refuses yogurt ate her entire snack! If Goldfish Colours are not available where you are, craisins (dried cranberries) would make a great substitution — or a mixture of craisins and dried blueberries! I hope you enjoyed this easy Dr Seuss snacks for preschool! If you’re looking for more family food inspiration, please consider checking out my In the Kids Kitchen blog, or my Little Chef ideas on Study at Home Mama! I love this! 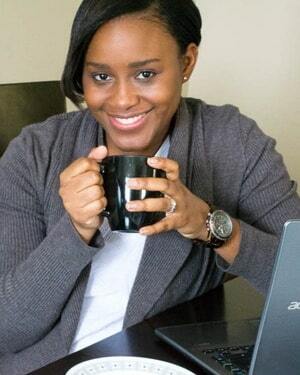 I am a Headstart teacher we do not serve candy,cake or cupcakes…only healthy food/snacks. So this is absolutely perfect! Thank you! 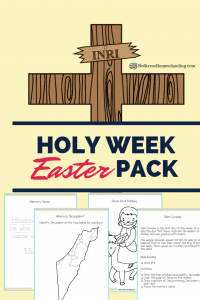 this is adorable and super easy to put together!